When we start getting really nice summer like weather, I start thinking about one of the guys I dated during the summer of 2013. He was much different than any guy I’ve ever dated. But then again, I could say that about all of the men I’ve dated. Anyway, I went along with it even though he was much younger than me. I knew it was going to be a fling and I was OK with that. At that time, I didn’t really want to get into anything too serious. He was (still is) a mechanic and part owner of the garage he worked at. He had travelled to a few different countries: the U.S., Japan, Russia, and across Europe, and he had plans for more travel. He seemed to be a hard worker, he was spontaneous and quite cute – tall, thin but muscular. I experienced a weekend with him that changed me. We had gone out on a Friday night. I don’t even remember what we did. Maybe it was a car ride through Gatineau Park because he really liked driving. He ended up sleeping over that night. The next morning, he didn’t seem like he was in a hurry to leave. So I suggested that we go out for breakfast. After breakfast, we got into his car and I expected that he’d just drive me back home and go off to do his own thing. “So what did you want to do now?” he asked. What? Really? You want to continue to hang out? I wasn’t expecting this. Most men I’ve dated, especially short term, didn’t usually prolong dates like this. To appease my inner voice, I suggested that we take my car. That way, if things went wrong, I could leave him there and come back in my own car. I had my cell. I had money. I had the means to “save” myself from discomfort if need be. Off we went to Montreal for the day! Well we had a lovely time. We walked along the streets of Montreal. I think the Jazz festival was on that day. We ate at Schwartz and got bubble tea in Chinatown. Even though I was with him, most of my time was spent in silence with my inner thoughts. We didn’t speak much. He wasn’t much of a talker, so it allowed me to quietly take in what I was experiencing. As we were walking along, I got a call on my cell. “Where are you?” my dad asked. “In Montreal.” “MONTEAL? !” My parents were also surprised at my spontaneity. I think it was about 8:00 pm when we decided to head back home. Nothing bad happened. I survived the experience. I even enjoyed myself! He slept over again that night. The experience I had with this man taught me to let go of my fear and live in the moment a bit more. To take a chance. The possibility of a little discomfort should not stop me from experiencing life. Since then, I’ve tried to be a little more relaxed and spontaneous. A few weeks after, I did the same thing with my daughter. I took her to Montreal for the day on a whim. She was thrilled that her mom did something so unexpected. My little adventurer! So do something that’s “not you” once in a while. Maybe you’ll find it’s more you than you thought. 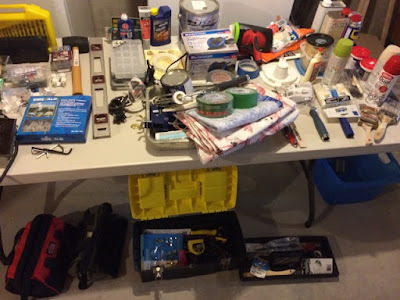 When I was going through my things in the basement to prepare for my upcoming move, I realized that I had a lot of tools and hardware. When I owned my own home, it was comforting to have these things because I was potentially ready to fix anything that could break down in the house. Folks, it feels like I’ve reached the end of my journey to simplicity – the blog… not the actual journey. I’m pretty sure I’ll always strive for simplicity. I just don’t feel the same passion for writing about it as I did in the beginning. Therefore, I’m giving myself permission to move on. Well, lately I’ve been concentrating on a new project: writing fiction. It’s something I’ve wanted to do since I was a child, and I’ve been talking about doing it for years. So I’ve finally decided to take it seriously. With the help of Mr. Romantic, I’ve created a new website where I write about writing, and share my fiction works with you. You can sign up for updates (I’ll try my hand at fancy schmancy email lists and stuff). I sincerely hope you do sign up! It makes me feel all warm and fuzzy inside knowing you, an actual living breathing person, are reading my words. For reals! I’m looking at myself in the mirror and I reach up to my face to adjust my glasses because they feel out of place. Only, I’m not wearing glasses. On March 15, 2017, I did one of the scariest things I've ever done in my life. I got laser eye surgery. I wore glasses for 20 years. So even though I can see that I’m not wearing eye-glasses because the surgery was successful, I still have the reflex and sometimes the feeling like I need to adjust my glasses. This got me thinking. For the past two years, I’ve been trying to improve. I’ve been trying to eat better. I’ve been trying to live a minimalist lifestyle. I’ve been trying to write a novel. I’ve been trying to become the most awesome me I can be. And I’ve been hard on myself for my “failures”. Learn it. Change it. Change yourself. Move on. Oh how my dreams have changed! "You didn't fail, you chose to stop!"